Guilloché or pantographed - are there pattern differences? As far as we know, there are two types of "etching machines" which both have been used by Swedish glassworks: the guilloché machine (which, we think, is the oldest type) and pantographs. The two types differ in various points. One important difference is that the guilloché machine only handles few glasses at at time, while pantographs can take several - between 12 and 36. When we have tried to find out which type (types) of machines were used where and when, we have met with several problems, one of them being the words themselves. The first machine we worked with was the "panto-graving" machine from Pukeberg (read more about it here, in Swedish only). Later, we have heard the same from other places: the guilloché machines were sometimes called that - a combination of "pantograph" and "engraving" machine. We have two hand-written pattern books, having examples of both guilloché and pantographed patterns. Beside several of the typical guilloché patterns the worker has written the word "aquarell-apparatus".
" The glasses [...] are carried to the etching machine. c) Such a machine is called "gilloscheringsmaskin". At Reijmyre there are 6 of them. They are equipped with an inner moveable part, in which the glass is placed and where it is turned and can be raised and lowered. From the side there comes an arm (by one handle made to turn in certain directions up and down and sideways) to make different patterns. 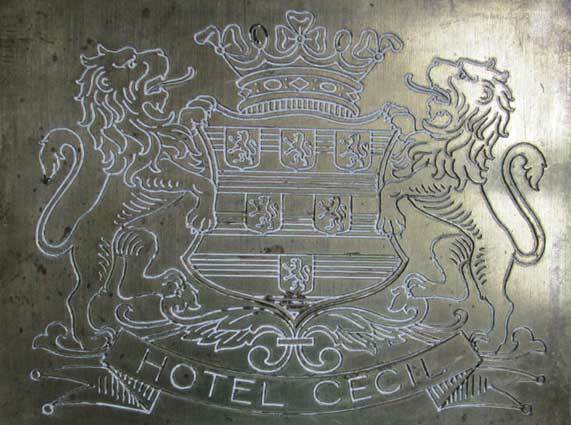 The actual etching, which is accompliced by the wax being scratched from the glass, is done by a different number of needles depending on different patterns. Ordinary sewing needles are used at Reijmyre, bent and attached by rubber bands. Or there are special needles for this machine, but they are both more expensive and less durable, as they are made from looser material (bought from abroad). 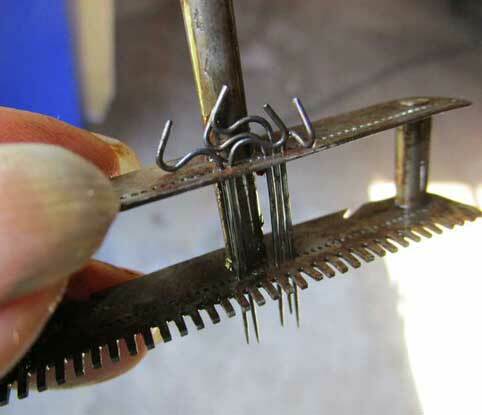 The holder in which the needles are fastened is usually called a comb. " Kaijser's notebook has a subtitle: "written on August 12 - 23 1919 (and other occasions)". His notes are very detailed, and they clearly state that Reijmyre had 6 guilloché machines. To me, it seems impossible that Kaijser could have missed the fact that there was also a very big pantograph, with 36 places, which can be read abot in the book Reijmyre 200 år. According to the following Reijmyre had two pantographs by this time. Kaijser was a "trainee" at the time. He was made manager in 1923, and remained so until 1926, when Reijmyre was closed down. In the book Glas från Eda it is said that, when Reijmyre was closed down, "press moulds, pantograph and etching machines were moved to Eda" – here we have two words: "pantograph" and "etching machine", used as if they were two different kinds of machines. Is etching machine (here) a synonym to a guilloché machine? 1890-ies Eda uses guilloché machine Eda glasbruk may be a general statement: "In the 1890-ies etching was done with a so called guilloché machine." 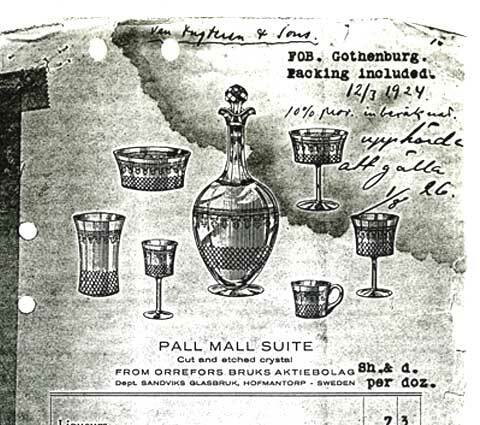 1890-ies Kosta produces pantographed restaurant glasses Steenberg in Modernt svenskt glas the book has a photo of glasses for Hotel Cecil, London - BGM has the template. See pictures below. There are British glass historians who doubt the dating - it ought to be later. The same list also mentions a "printing press for etching", at a value of 117 SEK. 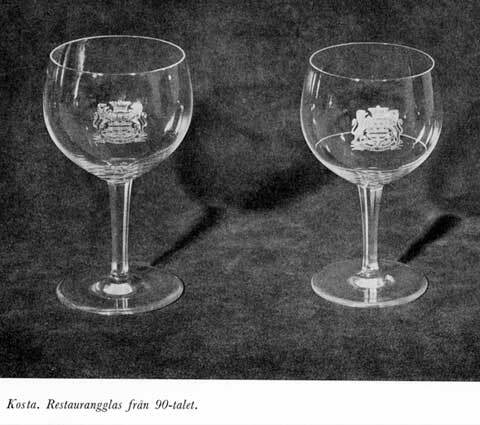 1898 template for IX Deutsches Turnfest Hamburg 23 - 27 Juli 1898 BGM has the template - were the glasses produced by Kosta? (Kosta sells 2 etching machines to Alsterfors) From Alsterfors at Digitalt museum - we regard these glasses as guilloché. This glass looks like deep etched, which might indicate the existence of a pantograph. 1912 Sandvik: Oscar Franzén began working there Glas, kultur, sammhällsdaning p 30: "There was much etching done, and the acid used was emptied outside the door." 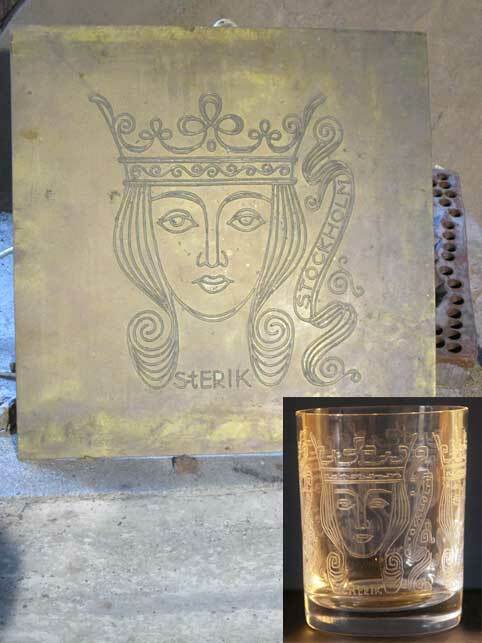 1914 Orrefors owned 2 etching machines which were used "for a couple of years"
] etching has not been used as a means of decoration at Orrefors since then"
1917 Elme glassworks is started, makes Färe a subsidiary. "after that" only the service Pall Mall is "processed", with blanks blown at Eda as Pall Mall is both cut and etched - HOW? 1926 Eda gets a pantograph and etching machines from Reijmyre (also the making of Pall Mall) Lersjö: Glas från Eda Despite the non-mention of pantograph(s) by Kaijser, at least there was one. Maybe the Venon suggestion (below) indicates the existence of two.
] a machine drew the patterns." 1946 Skruv burned down Ljuders hembygdsbok 2007 The etching shop, housed in a wooden building east of the hot shop, did not burn. (legendary glass-man to be) Generationers arbete på Boda Glasbruk "Post-production was advanced here: we had a big cutting shop, engravers, etching shop and painting shop." According to The Glass Factory, the only etching done in Boda was transfer etching. 1958 Pukeberg participated in the exhibition "Tre glasbruk" (Three glassworks) Göran Wärff's series "Himmel och helvete" (Heaven and hell) at Digitalt museum these may be the last newly designed pantographed glasses in Sweden? 2017 BGM gets a vertical pantograph for 12 glasses The machines were found in the old storehouse called "Långholmen" in Kosta. They were donated to BGM from AB Kosta glasbruk. Glasriket: Människan Miljön Framtiden - a series of books published by ABF in the early 1980-ies, no ISBN.
" Glasen [...] bäras till etsnings maskinen. c) En dylik kallas "gilloscheringsmaskin". Vid Reijmyre finnes 6 st. dylika. De är försedda med en inre rörlig del, i hvilket glaset ställes och där det snurras rundt samt kan höjas eller sänkas. Från sidan införes så mot glaset en arm (genom ett handtag eller vef rörlig i vissa riktningar upp och ned samt i sidled) så att olika mönster kan åstadkommas. Själfa etsningen, som består i att vaxet rispas bort från glaset, sker genom olika antal nålar allt efter olika mönster. Vid Reijmyre användes vanliga synålar, krökta och fastsatta med gummisnoddar. Eljes kan man ock köpa särskildt härför afsedda nålar, men de blifva dels dyrare dels hålla de ej så länge, emedan de äro af lösare material (köpas utomlands). Det munstycke, i hvilket nålarne äro fästade, kallas vanligen kamm. "